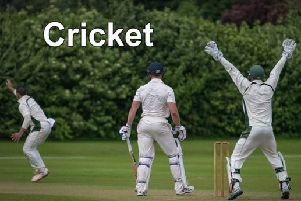 Woodhall Spa CC’s Second XI will begin their 2019 campaign on Saturday. The Spa men travel to face Grantham Seconds in the South Lincs and Border League Premier Division, the match beginning at 12.30pm. This will be followed by the Sunday Firsts starting their Lincoln and District League Premier Division fixtures the following day as they host Bracebridge Heath at Jubilee Park. Action will begin at 1.30pm. On Saturday Woodhall claimed an eight-wicket win in a friendly against Sleaford. Alex King (3), Peter Jackson (2), Sam Cherry (2) and James White claimed wickets as Sleaford finished their 40 overs on 210-8. The hosts responded with 214-2. Henry Wilson top scored with an unbeaten 101 and Oliver Caswell adding 88 not out. Matthew Sargeant scored 11.